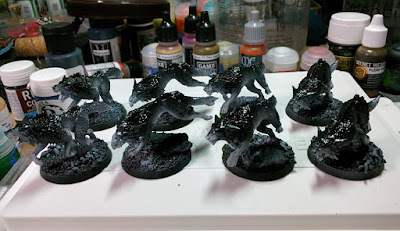 I have a group of Fenrisian wolves that I finally got a chance to throw a primer and base coat on. Whilst this was all straight forward, I wanted to get a more blue tint to the black of the fur. rather than washing it, I tried some Badger Blue Ghost Tint. 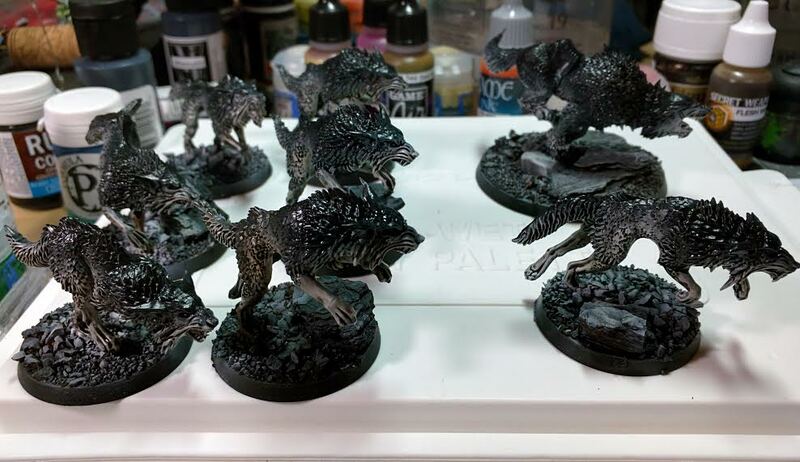 unfortunately I don't seem to have ever gotten the knack of using ghost tints, as they ended up leaving the surface all glossy, and overall I really wasn't happy with the finish. It was a pity, really, cause I had just finished up a nice White (Vallejo Model Air), to Wolf Grey (Vallejo Game Air), to Ice blue (Vallejo Game Air), to Medium Sea Grey (Vallejo Model Air) to black (Vallejo Model Air) transition.